Recently, at Modern Tipi, a Native-American owned store in Spokane, WA, featuring Native artists and Native-themed art, I ran across a beautifully framed picture of a Columbia River redband rainbow trout (Onchohynchus mykiss gardnerii). These redband trout inhabit the Spokane River and other regional waterways. 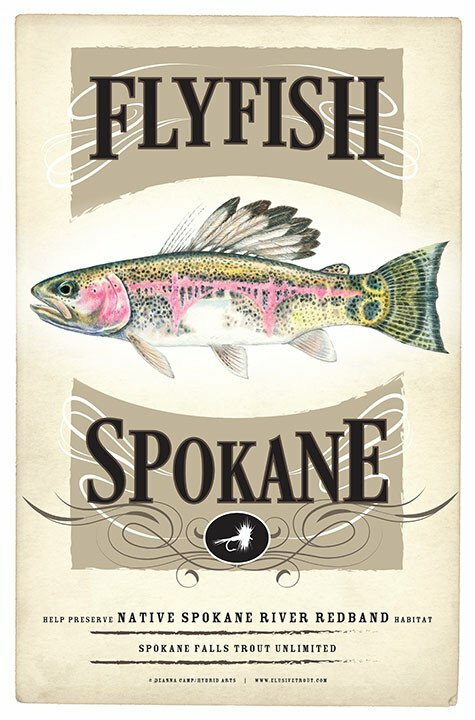 The picture is the central element on a poster produced by Spokane Falls Trout Unlimited to raise awareness and conservation funds for the trout. The stylized picture incorporates Spokane’s famous Monroe Street bridge into the trout’s red band and feathers into its dorsal fin. The feathers are a nod to the local Spokane Tribe of Indians, whom themselves are deeply engaged in regional conservation, often in collaboration with the other tribes comprising the Upper Columbia United Tribes. The artist behind the picture is Deanne Camp. You can find much more of her amazing art online at www.elusivetrout.com. If you are in the area, be sure to visit Modern Tipi, as well. Support your local artists, tribes, and trout. By the way, you can now follow The Literary Fly Fisher on Facebook. Go here, or click the “follow” button in the menu to the right of this page. This entry was posted on April 17, 2017 at 10:50 AM and is filed under Fly Fishing, The Arts, The Environment. You can follow any responses to this entry through the RSS 2.0 feed. You can leave a response, or trackback from your own site.